and pairing information summarized on a clear and concise interactive calendar. All important work-related and private information on a clear and simple calendar sheet. S4A Smart CREW INFO contains sophisticated communication tools for both peer to peer and multicast messaging and advanced yet easy-to-use discussion forum with configurable access levels. Built-in one-way communication functionality based on user roles, distribution lists, individual email addresses, employee numbers allows to send different types of messages also to flights (with automated or manual distribution modes). The built-in roster module includes personal events, open time bidding, roster swaps and remote check-in facility available on the advanced visual schedule with all information concerning flights, pairings, layover activities, training, holidays and transfers. The system displays only the information related to the current user and has the ability to export roster sheets to external calendar applications. Roster multi-search allows each user to browse the activities of other users. All roster information, messages and discussion forums in one application available on iOS and Android devices. S4A Smart CREW INFO Mobile provides crew members with full access to all of their roster information, company messages, notifications and discussion forums in one application available on iOS and Android devices. 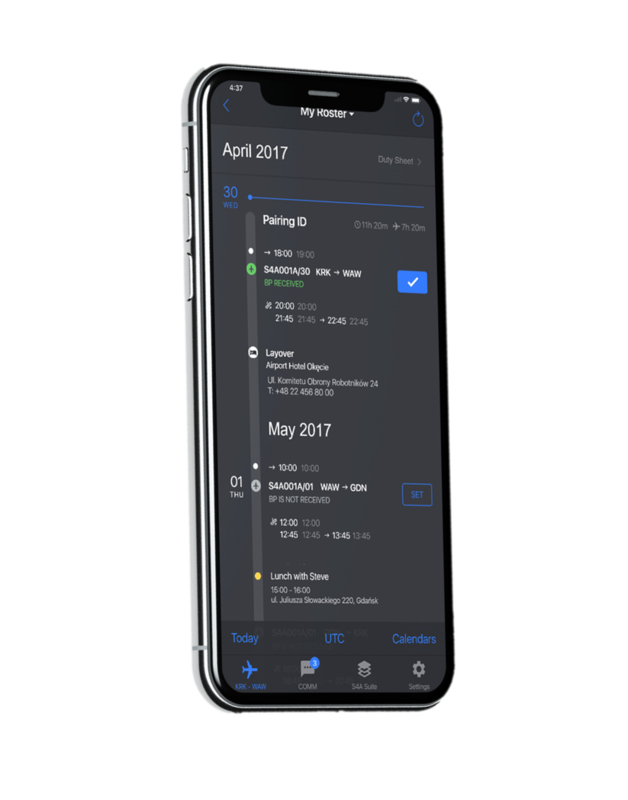 Airline crew members can use application for online and offline access to roster pairings, flights, base and hotel information and much more including a remote check-in and messages facility. One-way communication based on user roles, distribution lists, individual email addresses, employee numbers, etc. or provided as dedicated mobile application.